One of the big differences between Paleo and the typical modern diet is the amount of polyunsaturated fat, or PUFA. Basically, the modern diet has way too much PUFA, and also an imbalance between the two main types of PUFA, Omega-3 and Omega-6. What PUFA actually is and why it’s dangerous to eat too much of it. What Omega-6 and Omega-3 PUFA are and why they matter. Why we’re eating so much PUFA and such an imbalanced ratio of Omega-6 to Omega-3 PUFA. What to eat for lower total amount of PUFA and a better ratio of Omega-6 to Omega-3. 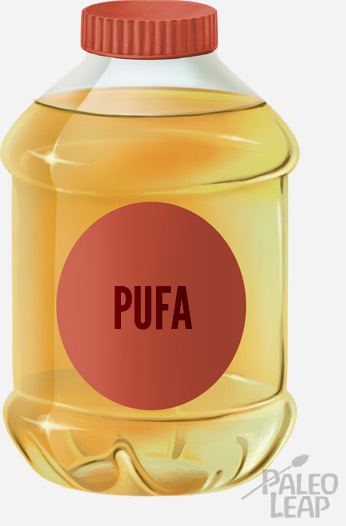 What the Heck is PUFA? (There are a few very minor other types, but we’re keeping it simple for now and these are the big ones). Some fatty foods are almost completely one type (e.g. coconut oil is 87% saturated). Others are much more mixed (e.g. bacon fat is about 39% saturated, 45% monounsaturated, and 11% polyunsaturated). Here’s an infographic showing some common Paleo cooking fats and which types of fat they provide. If you look at that infographic carefully, you’ll notice something: all the fats are pretty low in PUFA. There are plenty of high-PUFA fats in this world. Crisco. Soybean oil. Corn oil. Canola oil. “Vegetable oil.” Margarine. But none of them are Paleo, because the last thing we all need in our diets is more PUFA. So Why is this PUFA Stuff Such a Problem? The basic difference between these three types of fat is the way they’re structured. Without going into all the biology-nerd details, the structure of PUFAs makes them chemically unstable. More specifically, PUFAs are very vulnerable to damage from heat, light, and oxygen. If they’re damaged by heat, light, and/or oxygen (for example, if they’re used as frying oil over and over again, or just left out in a clear bottle on the shelf for months in a supermarket), they can get oxidized. Oxidized fats are dangerous because they’re inflammatory. Eating oxidized fats increases inflammation, and inflammation contributes to just about every chronic disease you could name, including heavy-hitters like obesity and diabetes. For example, in this study, researchers oxidized some soybean oil by heating it up a bunch of times. Then they fed it to rats. The oxidized soybean oil caused inflammation, which raised the rats’ blood pressure and contributed to hypertension. Want another example? This study found that oxidized PUFAs were at the heart of liver damage and Type 2 Diabetes in children with obesity. Drugs that reduce the level of oxidized PUFAs improve liver health. Even aside from the question of oxidation, the most common type of PUFA in the typical American diet (more on this below) stimulates an inflammatory response all on its own. All that inflammation is a big player in inflammatory diseases, which happen to be some of the most common diseases around today. Diabetes is an inflammatory disease; so are obesity, metabolic syndrome autoimmune disease, cardiovascular disease, several types of cancers, fatty liver disease, depression…(This isn’t to say that inflammation alone “causes” all these diseases, just that it contributes to them). The list of all the ways inflammation contributes to various diseases would probably fill several books, but if you want more, here’s a starter. So eating a lot of PUFA is pretty bad news. But in the past few decades, US consumption of PUFA has increased dramatically, from about 3% of total calories in 1909 to about 8% in 1999. The shift happened because we moved away from traditional, low-PUFA cooking fats like butter and towards high-PUFA industrial fats like soybean oil. (Get more background plus some pretty scary charts here). It’s a serious public health problem, and the irony is that it’s been sold to us as the “healthy choice:” vegetable oil is supposedly better for your heart than all that evil butter! There’s a tiny bit of truth to this idea, but only a tiny little bit. To understand the difference, you have to know about the two types of PUFA. There are two main types of PUFA: Omega-3 and Omega-6 (also called N-3 and N-6, or w-3 and w-6; these all refer to the same two types of fats). Today, we don’t just have a simple problem of too much PUFA. We have a complicated problem: too much PUFA in total, and way too much Omega-6, but actually a deficiency of Omega-3s. Our ancestral diets, the ones we evolved to live on, contained Omega-6 and Omega-3 PUFA in a ratio between 4:1 and 1:1. Our modern diets have Omega-6 and Omega-3 PUFA in a ratio closer to 10:1, or even higher. …and, of course, cardiovascular disease. Now getting back to the point about heart health: adding O6 and O3 PUFA to the diet improves heart health, but only because it improves the O6:O3 ratio. Correcting that ratio is the key, not some magic effect of adding PUFA. Adding O6 on its own doesn’t help, and might actually hurt. But most of the “heart-healthy” seed oils we’ve been eating are high in Omega-6 PUFA and low in Omega-3. That’s the exact opposite of what we want! We’re so incredibly deficient in Omega-3s that they benefit us even when they come with extra Omega-6. But you know what would be even better? Improving the ratio of O6 to O3 even more by getting more Omega-3s (from fish and seafood) while reducing Omega-6. Ideally, we would want a low amount of total PUFA with a low ratio of O6 to O3. This is what our evolutionary diet was like, and more importantly, we have plenty of actual scientific evidence that it’s healthier. What we actually have is a high amount of total PUFA with a high ratio of O6 to O3. “Heart-healthy” canola oil just adds more total PUFA, from sources high in O6 and low in O3. That’s the opposite of what we need. Ideally, what we would want to do is get less total PUFA with a lower ratio of O6 to O3. Reducing O6 PUFA in the diet reduces inflammatory oxidative damage. It’s important to stress here that the total amount and the ratio are both important. In other words, you can’t “fix” the problem of O6 overload by drowning yourself in Omega-3 supplements to “balance it out.” Omega-3s can be oxidized just like Omega-6s, and eating oxidized Omega-3s is just as inflammatory. Oxidation is rare if you’re getting your Omega-3s from whole foods like fish, but it’s very common for supplements to be oxidized because they weren’t stored properly or they were just low-quality in the first place. A picture is worth a thousand words, right? Well, here’s what to eat, in picture form! 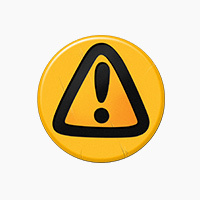 Avoid industrial oils (corn oil, canola oil, “vegetable oil,” soybean oil…) and anything made with them. Eat nuts and seeds as condiments, not a main course. Eat more wild fatty fish, like wild-caught salmon, sardines, and mackerel. Avoid fish oil unless you can be very sure about the quality of your supplement and the way it’s been treated until it gets into your hands. Remember, Omega-3s can be oxidized too, and fish oil supplements often are! Don’t stress about the exact ratio of O6 to O3. It’s not clear precisely what the “ideal” ratio is and it may be different for people with different health concerns, or people at different points in their life. And besides, don’t you have better things to do than count up grams of Omega-6 and Omega-3 fats at every meal? If you want more science-nerd details, here is a free full-text: it’s a slightly older study so it doesn’t have the very newest research, but it’s good on the basic background.